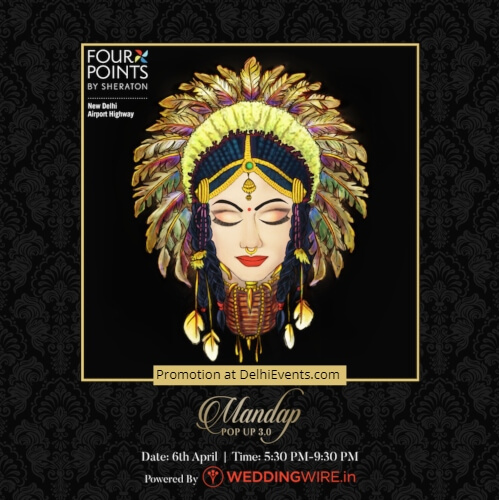 FPS Delhi is coming back with the third season of Mandap Pop Up -Mandap Pop Up 3.0 powered by India's largest wedding portal, The Wedding Wire. Like every succeeding year this is going to be bigger, better and crazier! The decorators coming on board will be even more premiere than the last 2 years and the designs displayed are going to be the answer to every couple dream come true wedding. About the artist : This event will have an acoustic singer Samahita Narang. Gifted with a beautiful voice this singer is bound to take you deep into the Indian Shaadi mode with her folk as well as trending soulful numbers. About the Organization : Four Points By Sheraton New Delhi is organising Mandap Pop Up (powered by The Wedding Wire). It is an experience-based exhibition where premiere Decor vendors showcase their exquisite quirky Mandap designs. The aura created at this event is to transport the guests into a beautiful wedding location, from music, lights, decor, delicious food this event brings on the mood like no one else.